Universal’nyi zhurnal [«Універсальний журнал»; Universal Journal, or UZh]. An illustrated journal for the general educated reader. 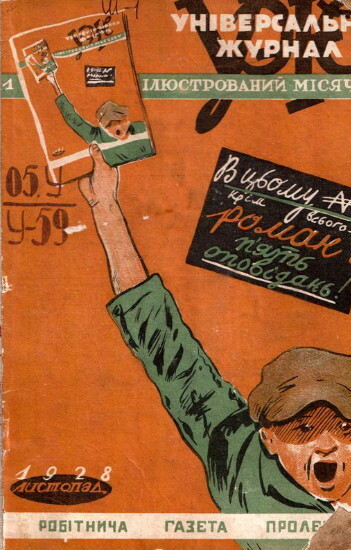 It was edited by a board consisting of Ostap Vyshnia, Mykola Bazhan, Maik Yohansen, Yurii Smolych, and Oleksa Slisarenko, and it appeared monthly in Kharkiv from November 1928 to August 1929. UZh published works by the aformentioned writers and by Mykola Kulish, Oles Dosvitnii, Volodymyr Gzhytsky, Mykhailo Semenko, Vasyl Vrazhlyvy, Oleksa Vlyzko, Leonid K. Chernov, Natalia Zabila, Leonid Pervomaisky, Kost Kotko, Yu. Gedz (Oleksii Savytsky), Serhii Chmelov, Yurii Shovkoplias, and M. Skazbush. It included literary translations; articles on civic matters, politics, international affairs, literature, art, film, science, and technology; humorous and travel sketches; and a chronicle of cultural events. 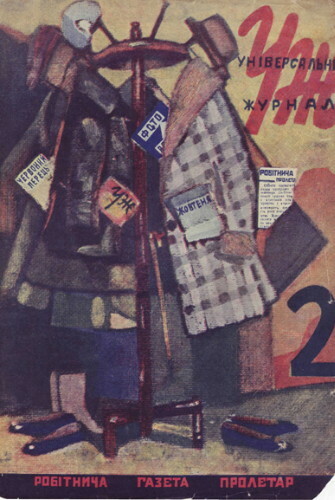 It was illustrated by Vasyl H. Krychevsky, Ivan Padalka, Anatol Petrytsky, L. Kaplan, Oleksander Dovhal, B. Fridkin, and other artists; it also published photographs.